Home » What Is the Best Golf Dress Code? What Is the Best Golf Dress Code? From Ben Hogan and Bobby Jones to Phil Mickelson and Tiger Woods, the best players have always been meticulous about their appearance when on the golf course. Dress codes vary in strictness and type from one golf course to the other. But what’s the standard dress code for golfers that will get you onto most golf courses? What type of T-shirt is considered the standard dress code for the golf course? In the vast majority of golf courses around the world, you’re required to wear a collared shirt. Some golf courses would expect to put on a shirt that has sleeves. If you’re a woman, you’ll notice that there are not so many rules to govern your choice of dress. But still, you must be neat and decent at all times. You’re likely to see most golfers wearing shorts in the summer and long trousers made during wet seasons. As a woman, you may want to formal shorts, long trousers, culottes, or capris. Regardless of your gender, make sure that your shorts are knee-length. Are there pants that are prohibited on golf courses? Take care not to wear jeans, sports shorts, and jogging trousers. The best colors for your golfing pants are khaki, beige, gray, tan, and cream. As you develop into a pro and move up the golf hierarchy, you may want to switch to flashy colors such as white and pink. The rules about hats to wear to the golf course are ambiguous but some hats are more popular than others. Baseball caps are more appropriate than cowboy hats. When buying a hat to wear when playing golf, try it first. You don’t want your eyes to squint due to excessive brightness. The hat should also offer protection from the sun on your head and the neck area. The way you wear the hat also matters. You can’t see top players wearing their caps facing backward. Do you want stability when you swing your club and still feel comfortable when walking around the golf course? Then, watch out for the shoes you wear. Rather than buy regular athletic shoes, go for specifically designed golf shoes. Ill-fitting shoes can cause blisters and even infections, especially if you account for the miles you have to walk when playing. Your shoe should not feel stiff on the interior. Instead, it should be soft and feel comfortable to boost your confidence. The outsole is crucial to the overall performance of your shoe, but be sure that it responds perfectly to your walking style and feet. Note that street shoes and sandals are forbidden in most courses. You may want to wear white socks to improve your appearance. For extra comfort and confidence, wear a belt. Something that’s less formal than what you wear to work. Also, wear glove cloves to enhance your grip on the clubs and prevent blisters. 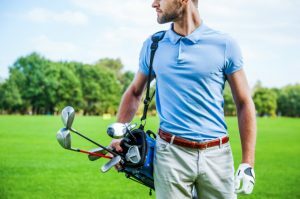 Although each golf club has its own dress code, the tips mentioned above ensure that you’re never out of place when playing your favorite sport. Always check the dress code of each golf course before signing up. If you’re a professional player on the LPGA, PGA Tour or any other major tournament, there are existing rules and a protocol you should follow. This is done to maintain the tradition of the sport.